Impreza STI Front 326mm Godspeed G Hook discs. 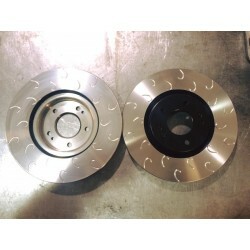 Godspeed Brakes Newest performance brake disc, We have been working for several months to perfect the G hook discs, They are now ready for release, The new G hook is designed to reduce heavy braking noise and improve bite. All our discs come with black coated centres as standard to help against corrosion. No added extras for coated discs. Please confirm what year STI you have so we know what PCD discs to send.